Our Cape Coral motorcycle accident lawyers and the staff at the law offices of Associates and Bruce L. Scheiner, Attorneys for the Injured, would like to extend our condolences to the family of Scott Wheeler, an off duty correction’s deputy who was killed in a motorcycle accident on Wednesday. The News-Press reports Wheeler’s Yamaha motorcycle collided with a vehicle making a left turn onto Pine Island Road from Skyline Boulevard. The crash happened just before 6 p.m. The investigation is ongoing and no charges have been filed. Wheeler, 24, has been a correction’s officer since 2008 and leaves behind a fiance, who is pregnant, and two children, ages 4 and 5. The death was the first traffic fatality of the year in Cape Coral and the third in Lee County, according to the Florida Highway Patrol. It also serves as a tragic reminder to ” Watch for Motorcycles” throughout South Florida’s winter riding season. The National Highway Traffic Safety Administration reports 5,290 riders were killed in 2008 and more than 96,000 were seriously injured. Florida motorcycle accidents accounted for 523 riding deaths. Only California (537) reported more fatal accidents. Motorcycles can be hard to see. And their small size makes judging speed difficult at best. As we reported last fall on our Florida Injury Lawyer Blog, the winter is prime riding season in Florida. 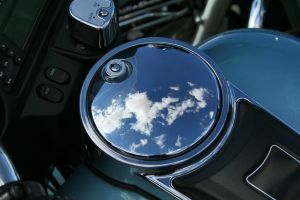 The Motorcycle Safety Foundation’s “10 Things All Car, Truck and Bus Drivers Should Know About Motorcycles” are worth repeating often. -When a motorcycle is involved in an accident with another vehicle — the driver of the other vehicle is usually to blame. -Motorcycles can be hard to see and can hide in blind spots. Look twice and use extra caution when pulling into the roadway. -It’s tough to judge a motorcycle’s speed. Assume it’s closer than it appears. -Don’t rely on a motorcycle’s brake lights — a rider often slows by backing out of the throttle and downshifting. -Motorcycles often move around within their lane. Don’t crowd them. -Turn signals on motorcycles do not shut off on their own. Make sure you know a rider’s intentions before proceeding. -Don’t expect a motorcycle to be able to dodge out of your way. -Don’t expect a rider to stop on a dime — a motorcycle requires about the same distance to stop as a passenger car. -Visualize a motorcycle as a person — the rider is just as vulnerable. -Motorcycle accidents typically result in very serious or fatal injury to the rider. Don’t subject yourself to that guilt for the sake of saving a few seconds of drive time.